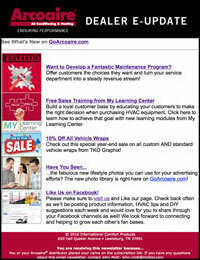 Sign Up for Arcoaire® Dealer E-Updates Now! Arcoarie® dealer e-updates deliver the latest information on new products, regulations and training directly to your inbox. This e-newsletter is designed specifically for HVAC contractors and includes links to all the new Arcoaire content you haven’t seen yet. Get notified when new stories are posted so that you don’t miss out! What types of information do Arcoaire Dealer E-updates include? 1. Type your email into the box below. 3. Select your distributor from the menu in the shadowbox. It's that simple. Sign up today!